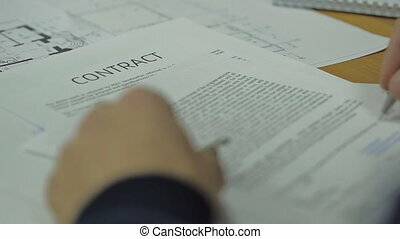 Business people Mutual Agreement Signing Signature Of The Business Contract. Naim is possible to work, sub-contracting for performance of the obligations or promising place, kabbalnye conditions or the general form of the bank for a loan, lease, who knows. View close-up, text form is not readable. Modern experts, talk and argue very active and hot in his office. 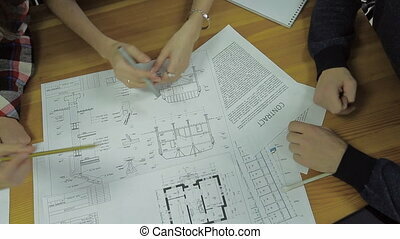 maybe it's the architects, electricians or designer, builders and managers can and work colleagues. View close-up, they sit at a wooden table. heated discussion paper on changes and revisions in the draft paper printed. 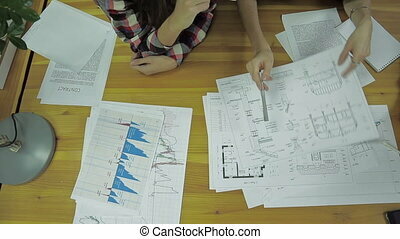 Two beautiful young women considering and discussing something on the sheets of paper. One of them has dark long hair, wearing a plaid shirt, the second has a black jacket, short fashionable hairstyle, dark eyes and big earrings. 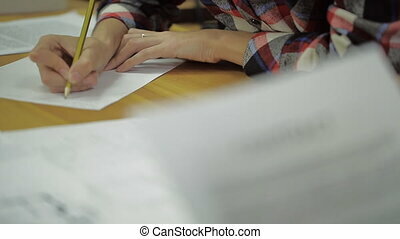 They look attentively, gesticulating, shift the papers from place to place. Blonde girl purses her lips and shakes her head, she is clearly doubt something. Behind them shelves with folders are standing. 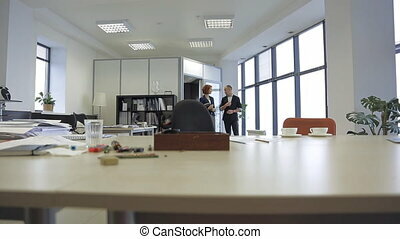 at a meeting of male colleagues take out a woman, and she throws the paper in the air. 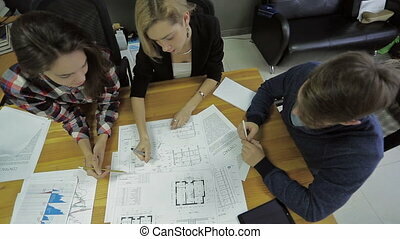 Four workers sit at table and discuss working project. Suddenly, woman sharply ups from her seat and rage throws up documents. 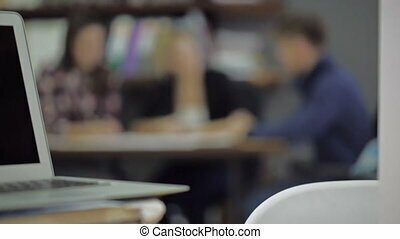 Atmosphere becomes to be nervous and unpleasant. Everyone in room feels discomfort. 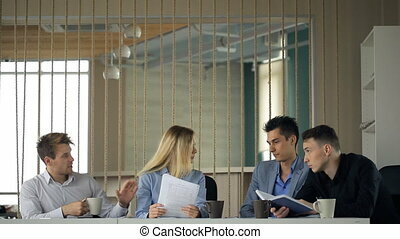 Four workers sit at table and discuss working project. They decided to organize meeting in day time to share opinions with each other about further development of strategy of their company. Business people reading the contracts and his colleague had record in the form of its data. Naim is possible to work, sub-contracting for performance of the obligations or promising place, kabbalnye conditions or the general form of the bank for a loan, lease, who knows. View close-up, part of the text is visible and readable, in the background to blur the second man, who actively signed the paper. At the table young group of three works on a drafting project. 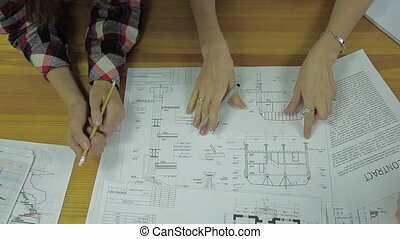 Female business leader distributes a mock-up on paper for designer and architect to create an engineering solution for building for customer. Young hipster working at his studio loft. 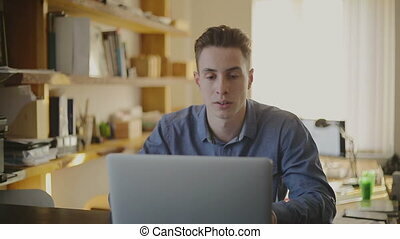 He sits in front of his computer near steel table desk. He is talking on the phone while sitting at your workplace His workplace is located in an office building with a few jobs there and wooden shelves in the background. 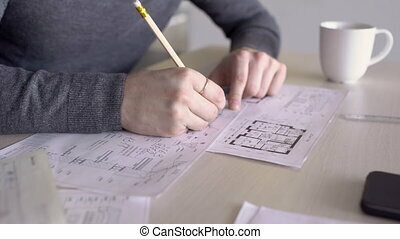 Probably he is an engineer or an architect, a photographer, or just a modern creative person. On the other hands he can be creating concept for project or web design, designing something associated with the magazine or news articles. He looks very enthusiastic, interested and self-confident. 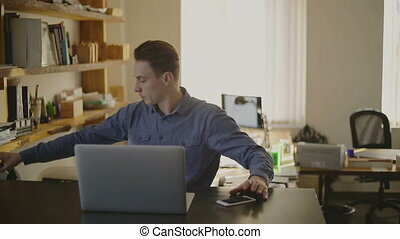 He sits in front of his computer near steel desk. He is talking on the phone while sitting at your workplace. His workplace is located in an office building with a few jobs there and in the background working young woman with wooden shelves. Probably he is an programmer or designer, art director, a photographer, or just a modern creative person. On the other hands he can be creating concept for project or web design, designing something associated with the magazine or news articles. Part of my call center worker working at office or agency series.